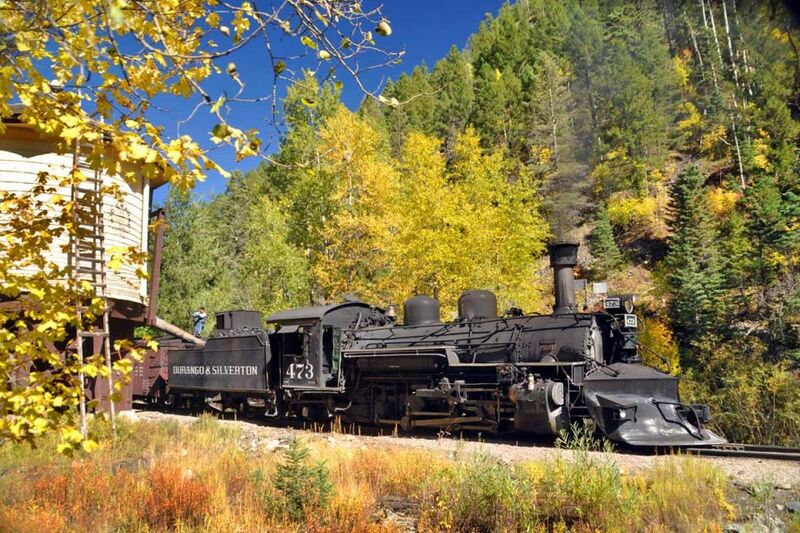 If you’re a photographer, a train aficionado, a lover of fall colors or any combination of the three, don’t miss the unique opportunity to ride the Durango & Silverton train, enjoy the fall foliage and deboard midway through the ride for fantastic photo ops. The Durango & Silverton railroad’s 24th annual Fall Photo Experience is coming up Sept. 28 and 29. Whether professional or hobbyist, photographers will be able to ride the train into the San Juan National Forest where they can disembark, set up their gear as the train backs up, then catch shots of the train — a 1925 locomotive pulling Tuscan-red, premium-class cars — as it chugs past a backdrop of vivid autumn foliage. Both days, the photo trains will depart Durango at 9 a.m. and return at 6:50 p.m., allowing for the best possible morning light and late afternoon light — known as the “Golden Hour,” although, in this case, it may have more to do with the golden aspens than the golden light. If photographers arrive at the station early, they’ll also have the chance to photograph locomotives hooking up and the two passenger trains departing at 8 a.m. and 8:45 a.m. There will also be an opportunity to snap pictures of the Durango & Silverton passenger trains as they steam past in the afternoon. Tickets for the Fall Photo Experience can only be booked by phone, so call 970-247-2733 or 888-872-4607 to reserve your spot, or visit the Durango & Silverton railroad website for more information. While you’re planning your trip, be sure to check out the amenities at the Durango Quality Inn and book your room today for your photo-filled weekend.